Nighttime snoring is a serious sleep disorder that affects roughly 70 million US adults today. You might think snoring is less serious than it sounds, but it can actually lead to life-threatening health issues when left untreated. There are a wide variety of devices that you can buy to help treat your snoring. The most popular is a Mandibular Advancement Device (MAD) that shifts the position of your lower jaw to stop snoring. The ZQuiet is an anti snoring mouthpiece that pushes your jaw forward to keep the tongue from blocking the airway. Out of other types of MAD mouthpieces, this one is designed to fit comfortably in your mouth. Remember, your mental and physical health is important, and so it’s important to put effort into finding a way to get the best sleep of your life! To help you, we’re taking an in-depth look at the causes of snoring and how a ZQuiet anti snoring mouthpiece may be the solution you need to better sleep. You may feel embarrassed about your snoring, but it’s a common issue that is more serious than many people understand. Do you wonder why you snore? Or why it’s so difficult to stop? Certain physical conditions of the nose and throat can lead to snoring at night. When your passages aren’t able to get enough air as you breathe, it leads to the vibrations that cause snoring. Your nose’s septum may shift to one side to affect your ability to breathe. You may also have blockages in the sinuses–which is common during allergy season or if you have a cold. Another cause could be enlarged tonsils or adenoids, which cause vibrations in the back of the throat. As people get older, they often discover that they’ve started snoring. This is because the throat muscles and tongue begin to relax more during sleep, which causes the tongue to fall back and obstruct the airway. The result is that vibrations on each inhale cause snoring. Whether you sleep on your back or on your side can affect how much or how little you snore at night. When you sleep on your back it causes a shift in your body and can likely lead to snoring. Why does sleeping on your back worsen snoring? It’s because your mouth falls open and changes the shape of your airway. Also, gravity plays a major part in compressing your airways. This is why researchers recommend sleeping on your side, because it allows for open airways and lowers the chances of disruptive snoring. Those who are “side-dependent” snorers may see huge results by turning onto their sides. It may take some time to get into the habit of sleeping on your side, but it will be worth it in the end. In the past, individuals used to enjoy a small “nightcap” before turning in for the night. Recently though, it’s been discovered that drinking alcohol before bed can lead to increased chances of snoring. This is because alcohol works as a muscle relaxer, which means the muscles in your throat and tongue go slack and block the airways. Once this happens, vibrations begin and you’ll spend the rest of the night snoring away. Similarly, certain drugs that are muscle relaxants may cause you to snore at night. Be aware of what you take before bed because it may be a cause for your snoring. Those who are overweight will have more tissue around the neck and throat, which can compress the airways at night and lead to snoring. Often, when an individual isn’t sleeping well they will have a greater chance of gaining weight. This can increase the severity of snoring. No matter the cause, if you regularly snore at night then it’s important to address the issue instead of leaving it untreated. Not only can snoring lead to major health issues down the road for yourself, but it also can have a negative impact on those around you. Has your snoring ever been so loud that it woke you up? Individuals who snore will experience a lower quality of sleep and suffer from tiredness throughout the day. In some cases, snoring can be an indicator of sleep apnea. This sleep disorder is caused by obstructed airways that lead to repeated ten-second pauses in breathing throughout the night. It’s a major health concern that causes fragmented sleep and low blood oxygen levels. Whether your snoring is mild or severe, it can lead to serious issues that affect your ability to lead a healthy life. Your health is the number one reason why it’s important to get a good night’s sleep. Short term effects of poor sleep may appear as low energy, not being able to focus, or bad memory. It may also make it difficult to do simple tasks like driving to work or studying for a test. Long term effects of poor sleep can be weight gain, diabetes, or heart disease. It can even put you at greater risk of heart disease than those who smoke or have high cholesterol. Scientists urge those who snore to seek treatment as soon as possible and don’t ignore the health risks of snoring. The longer you go without treating your snoring, the greater chance you have of damaging your health. If you’re trying to figure out how to stop snoring, then there are plenty of products out there on the market. One of the most popular devices is called a Mandibular Advancement Device (MAD), and it is worn in the mouth to change the position of the jaw and tongue. Although MAD products can often be bulky and uncomfortable to wear, researchers have found ways to make them more comfortable. The ZQuiet mouthpiece is a MAD device that is designed specifically to be comfortable and easy to wear all night. It fits easily over your teeth and allows you to move your mouth once in. You can talk to someone or get a sip of water even while you’re wearing it. This is one huge difference from other MAD products, which are normally too bulky to allow for any jaw movements. Think this might be the right product for you? Read on to learn about the benefits of using the ZQuiet mouthpiece and how it can help you get a better night’s sleep. When you wear the ZQuiet mouthpiece, its design pushes your jaw outwards so that your tongue won’t fall backward and block your airways. The way that it positions your mouth makes it easier to get plenty of air with each breath, and the open airways mean there’s no chance of vibrations that lead to loud snoring. Wearing the ZQuiet anti snoring mouthpiece can improve your quality of sleep because it stops the causes of snoring and is comfortable to wear. You can feel peaceful wearing it because of its high-quality material, dentist-approved design, and FDA-approval. It’s a simple yet effective device that makes a quiet night of sleep possible. As simple as it is, there are some elements to consider when trying it out. If you’re not used to wearing mouthpieces at night, then trying out the ZQuiet could feel awkward at first. Some anti-snoring mouthpieces tend to be bulky and uncomfortable, but the ZQuiet is surprisingly comfortable in the way that it fits over the teeth. It has a sleek design that feels compact in the mouth. Also, it’s made of a medical-grade thermoplastic polymer, which makes it softer and more flexible than other products. You also don’t have to worry about weird chemicals getting into your system because the ZQuiet is latex-free and BPA-free. It doesn’t mold to fit the exact shape of your teeth but instead is designed like a whitening tray. This can be nice because it means you don’t have to bother with complicated boiling and sizing to get it into your mouth. However, the ZQuiet designers still want you to be able to get a comfortable fit. Because of this, when you open the package you’ll see that it comes with two separate mouthpieces. One pushes out the jaw less, while the other is designed to push your jaw out much more. You’ll want to test out the different sizes to see which one is better for your mouth. For those who have smaller mouths, it’s easy to resize the ZQuiet mouthpiece. All you have to do is trim it down with scissors and then use a nail file to smooth out the edges. It might take a couple of nights to figure out what size is most comfortable for you. The nice thing about the ZQuiet mouthpiece is that it’s easy to adjust without any fuss. Since it’s made from a soft polymer, you’ll want to be careful with how you wash it. Don’t use hot water or toothpaste, which may cause it to melt or break down. To clean your ZQuiet mouthpiece, use soap and mild water. Gently wash it with a soft-bristled toothbrush and lay it out on a clean surface to dry. Although it’s softer than some mouthpiece products, you should be able to get at least 12 months of usage out of it. Instead of struggling through a difficult sizing process that could potentially ruin your mouthpiece, the ZQuiet is designed so that you can wear it straight out of the box. Some mouthpieces can be bulky, but the ZQuiet mouthpiece was designed by dentists who understand the anatomy of the mouth. This means it fits nicely behind the gums so that it’s comfortable to wear all through the night. It also has airflow holes, which means you can still breathe through your mouth when you’re wearing it. So if your nose is stuffy, you can still breathe well while the device holds your mouth in place. Perhaps the greatest element of the ZQuiet mouthpiece is its unique Living Hinge design that allows you to move your mouth while wearing it. Other products hold your jaw in place without allowing for any movement, which means you have to take it out to talk to your partner or get a drink of water. With the ZQuiet’s unique design, you’re not only more comfortable while wearing it, but less restricted too. You can rest assured knowing that your ZQuiet mouthpiece is designed safely for you. It’s regulated by the FDA and classified as a Class II medical device. When you make a ZQuiet purchase, you receive two separate mouthpieces that push out the jaw differently. This enables you to find a size that works better for you. Also, the soft plastic material makes it possible to trim down and adjust so that it fits perfectly. Like any product, it’s important to know exactly if an anti-snoring aid will work for you or not. For individuals who wear dentures, a mouthpiece may not be the best way to stop snoring because it can damage your dentures. Instead, you might try a chin strap or other anti-snoring devices. You don’t need to suffer the consequences of bad sleep because of your snoring habits. Devices like the ZQuiet mouthpiece make it possible for millions of people to sleep well and feel refreshed after a night’s rest. If you’ve been suffering through years of poor sleep because of constant snoring, then it might be a good time to try out an anti-snoring device. You can get ZQuiet today or try out another form of snoring aid. 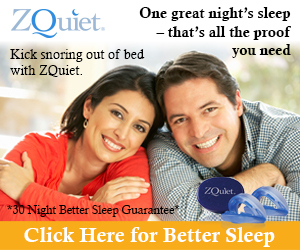 Try ZQuiet For 30 Days – Just pay $9.95 plus Shipping And Handling. Order Now! As always, we hope you found this article “ZQuiet: A Complete Review of the Snoring Mouthpiece” both informative and entertaining. If you did, may we ask that you share it with your friends and family through social media. It really helps us a lot and is greatly appreciated! Many people don't realize that anti-snoring mouthpieces not only treat snoring, but are helpful for sleep apnea too.